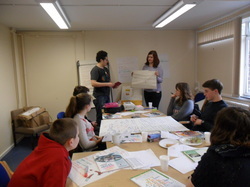 The Bromley Youth Advisory Panel was created to give young people a voice in park development. Parks and green spaces are very important social spaces for everyone and by working together we can develop our parks into safer and more enjoyable places for young people. In 2006 BYAP was given a green space in Chislehurst to make their own and transform into a new park. BYAP members developed ideas and designs for their park which included a steel semi circular bench, bird and bat boxes, wildlife surveys, and working parties.